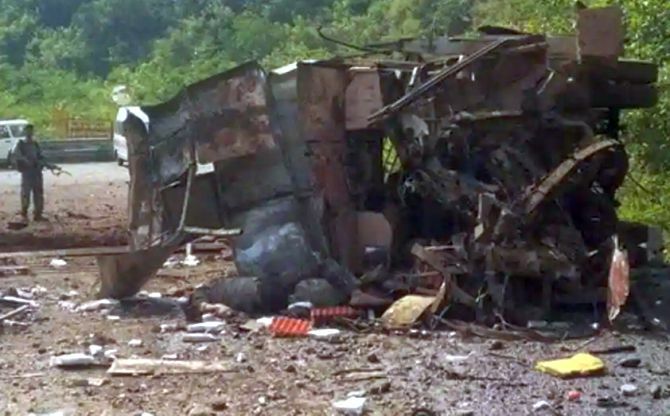 Four civilians and a Central Industrial Security Force jawan were killed when suspected Naxals blew up a bus with an improvised explosive device in Chhattisgarh’s Dantewada district on Thursday, four days ahead of the first phase of assembly polls in the state, police said. Two personnel of the CISF were also injured in the explosion, the third Naxal attack in 15 days in the poll-bound state. The attack comes before Prime Minister Narendra Modi’s scheduled visit on Friday to Jagdalpur district, about 100 km from Dantewada, to campaign for the Bharatiya Janata Party. The IED explosion took place in a hilly area in Bacheli when the CISF personnel, belonging to 502nd battalion, were returning to their camp in Akashnagar area after purchasing groceries from a local market, said Dantewada Superintendent of Police Abhishek Pallava. The Naxals triggered a powerful IED blast near curve no 6 on the hills, he said. The truck driver had taken lift in the bus, another police official said. Two CISF constables -- Pathare Satish and Pishal Suresh -- were injured in the attack, Pallava said. Before that, on October 27, four Central Reserve Police Force personnel were killed and two others injured after Maoists blew up their bulletproof bunker vehicle in Bijapur district. The first phase is to be held in 18 Naxal-affected constituencies of Madhya Pradesh’s Bastar region, that falls in the southern part of the central state.